Pyramid , Flat Spoon , and a No Name? 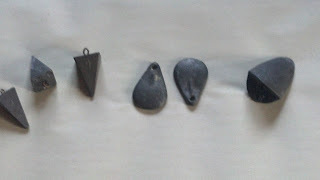 Different sinkers have different uses , but mainly they have angles or flat spots to keep them from rolling in the surf. Everyone has a personal favorite , so you'll have to experiment until you find what you like. We are going places now! If you've made it this far , you're probably wondering about bait. People can and do use all sorts of crazy things for bait , but the cheapest and easiest are fresh shrimp or squid. For raw shrimp , just peel them and slide them on the hook so that they maintain their natural curve , or you can use small pieces if you're using smaller hooks. For squid , they have to be cleaned and cut into smaller strips (triangular or rectangular). 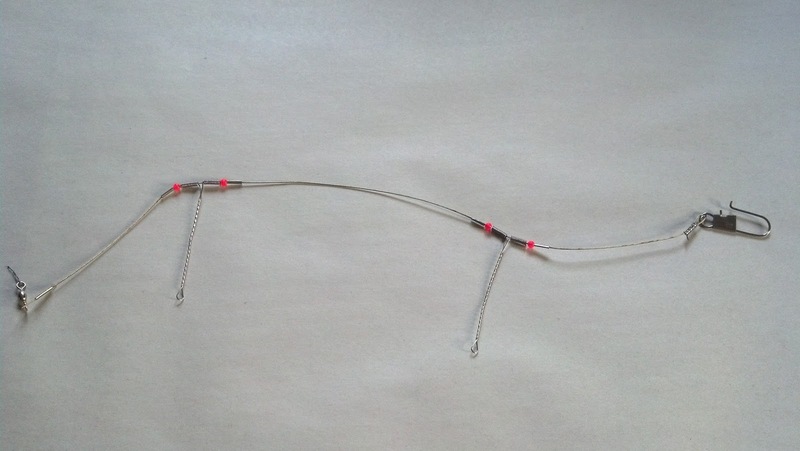 I like to hook squid strips close to one end so that the rest hangs from the hook and moves in the waves. Fish love it! There are a lot more options for bait , but a few other things for your bottom rig would be : Bloodworms (real or artificial) , clams , sand fleas , small pieces of fish (my favorite for bigger fish) , and just about anything else that you think a fish might find appetizing! It helps if it is something they are used to seeing or smelling in their natural environment , but most species in the surf aren't picky. You don't have to cast half way across the Atlantic to catch fish! Some of the biggest fish I've seen were caught just behind the breaking waves , and some impressive smaller species right in the break. From a pier , you can drop your rig straight down or just use an underhanded toss. From the surf , I recommend an overhand cast straight out , but everyone casts differently so use what works for you , just be sure to check your surroundings so no one gets hurt. A trip to the ER to have a fish hook removed is a bad start to any fishing trip. Having a rain jacket has saved a lot of trips for me , but they aren't really necessary. It's also worth noting that lots of anglers will take two coolers to the beach. A big one for fish and bait , and a smaller soft sided cooler for snacks/drinks. There you have it - a basic surf fishing guide to get you started. Welcome to Surf-Fish.com ! Check back next week for a bigger rig for bigger fish and more in depth instructions for line , rigs and bait! Thanks , and I sincerely hope it helps you out! There's a ton of info in the archives at right that goes into different rigs and bait , or if you have a specific question , I can always be reached via the "Contact Us" Page above! Best of luck to you , and tight lines! Great write up. Don't you guys use "Spider" weights to keep the bait in one spot? Here is Cali we have some pretty strong tugs and it can push it right back in our South in a few minutes. Anyway thanks for site and time. Thanks for the kind words! I really need to get back to work on this site , and words of encouragement are a good reminder! As for the Spider weights (We've always called them Sputnik Sinkers or Storm Sinkers) , some people like them and some don't. They save about an ounce of weight in rough water , but in my experience cause more tangles than they are worth. We do use big , heavy Spider-type sinkers for anchors when we are live baiting for King Mackerel and Cobia , but those are 10-12 ounces and usually sit at the end of a long cast for hours on end. It's complicated to explain ,but I have heard a few people talk about a similar style of fishing in So Cal. I'd love to talk fishing with a LeftCoaster , so give me a shout via the contact form above! thanks for the tips! I have recently decided to start fishing so that my husband and I can do something outside together(I won't hunt with him lol) this article was great at explaining the equipment! I will be checking the rest of the site out to see how much more I can learn before our afternoon fishing trip! 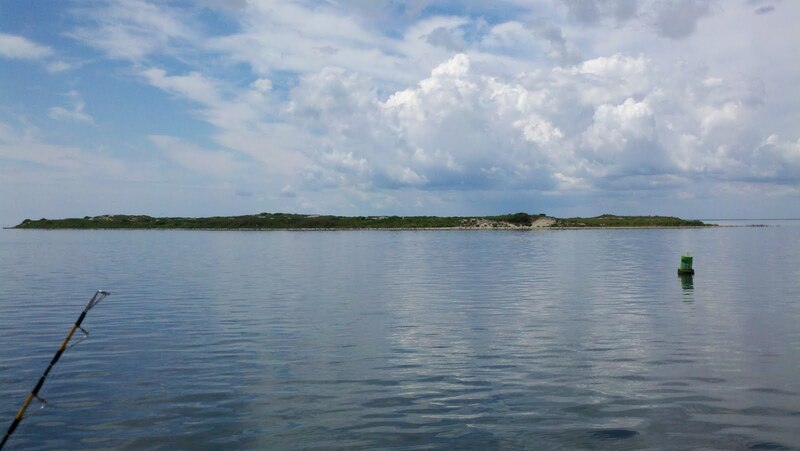 I'm big into bass fishing here in Austin, TX but I have some friends coming in from Germany and we are going to hit up Mustang Island this coming april/may. I see saltwater fishing is a lot different than fishing for bass at the lake. Thank you for this guide, it really helps me nail down some of the gear I need to pick up. Since I probably wont go more than once a year, I appreciate the honesty in going a little bit smaller. So I don't need a 10ft rig? I could do alright with a 8' or 9' to save a few bucks? or is the 10' a better option for redfish/shark/whatever else decides to eat my bait? The 10' rod is generally for casting farther with heavier weights, and better for putting pressure on reds, sharks, and other bigger fish. You can certainly get by with 8 & 9 foot rods until you get used to everything. I usually take a 10 , 2 9's and a couple of heavy bass rods to toss lures with. The 10 gets a fish finder rig, the 9's get 2 hook bottom rigs, and I usually put a big bucktail on one lure rod and a spoon or gotcha lure on the other. You'll be surprised by how affordable surf rods are for their size, but just like bass rods, spending more usually gets you a better rod. Some of the 8-9 foot catfish combos are very serviceable at the beach! I'll be happy to help steer you in the right direction if you have any more questions! Just post them here, or use the contact form. Tight lines! I am doing my first shore fishing in a couple weeks on the pacific in Nicaragua. I can only transport a short rod and being in the prairies the only choices I have locally are a 3 piece 7' medium heavy or telescopic 7'. Do you think this will do and what do you suggest for a corresponding line and weight? I would go with the medium heavy and lighter line, say 10-12? I know in California they use 6 pound line and 1/4 ounce weights in the surf for fish like Corbina , but I have very limited experience with Pacific fishing. The North Atlantic where I fish is far rougher and calls for heavier line and weights for even small fish. Sorry I can't offer more assistance! I need very specific advice...I've spent hours combing every surf fishing post under AL Gores world wide Web and there is so much information I'm lost. But I'm low maintenance. I'm planning on surf fishing off Dauphin Island, the Katrina Cut and other drop-offs are locally well known. Just tell me what to buy so I don't break my rod or line. We are coming from the great Lakes and I know pulling in a saltwater catch is way different from a Gar. A rod reel setup, something long enough to cast over the breakers amd line strong enough to pull in the occasional big fish. What's my go to? But I'm low maintenance. I'm planning on surf fishing off Dauphin Island, the Katrina Cut and other drop-offs are locally well known. Just tell me what to buy so I don't break my rod or line. We are coming from the great Lakes and I know pulling in a saltwater catch is way different from a Gar. A rod reel setup, something long enough to cast over the breakers amd line strong enough to pull in the occasional big fish. What's my go to? If I'm gonna throw my money at something tomorrow what would u recommend? Angela, thanks for stopping by and leaving a comment! If I had to make do with just one rod, I'd get something like a Berkeley big game catfish combo or an ugly stick combo, they come in 8-9 ft, with a decent reel and 20 lb. test pre spooled. They are a MH rod rated for 2-4 ounces, and the longer rods will get you those longer casts. They are just a good all purpose rod, capable of tossing bottom rigs and fish finders, and even a big spoon or jig in a pinch. 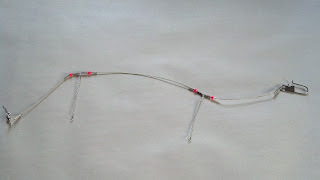 I would recommend a 40-50 pound shock leader twice the length of the rod and 3-4 wraps around the spool hitched to the main line with an Albright knot above your rigs. That'll keep the heavier weights from breaking the 17-20lb main line during casts, and will double as a bite leader if you decide to throw that big spoon. Tight lines! Give us a report after your trip! Glad I could help! You can email me through the contact page if you have any specific questions! It's always good to plan ahead, and at least you'll be prepared. One of the best things about the catfish combos is that you can use them for freshwater cats, Stripers, maybe even gar or lake trout. How'd your fishing go? Our family is making the same trip in October and I'm really looking forward to some surf fishing. I'm also from the mid west. Do you have any specific pointers? Can explain the material and details like the length to tie the hooks to the metal double bottom rig? Finally a non commercial article on what gear we'll need to get started. My husband and I are finally retired at the shore and want to start surf casting. Looking fwd. to days of wet feet, fish and fun. Thanks so much for sharing. Thanks Josh for the information I have found it very helpful! I am a NOOB and I have not purchased any gear just yet, but I do have a question about fish... I live in Mexico, but when I decide to out for my first fishing trip how do I know what fish are eatable and how to identify them? Super confused, Is there a fishing book that would help me in this situation?